Children love jumping in puddles and playing in the mud. 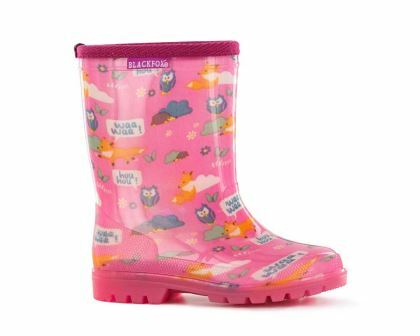 Foxy boots will keep there feet nice and dry. The boots are not only brightly coloured they have fox or other forest images but also have flashing lights along the outer sole which the children will love. The boots are made of EVA. They are very light, flexible and fully waterproof. Wash with clear or soapy water allow to dry naturally. Store away from heat and direct sunlight. Boot sizes should be similar to shoe sizes.